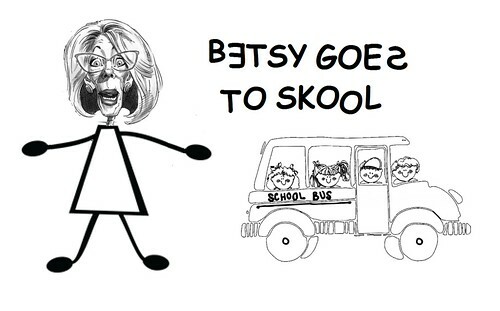 We’ve all been saying that the Trump Administration’s for-profit-school-loving Secretary of Education Betsy DeVos has no experience in public schools, but that’s not exactly true. Working with a church group, Mrs. DeVos had her chauffeur drop her off at Burton Elementary School in Grand Rapids, where she tutored– “mentored” one student for one hour each week. The public school, where 97.6% of students get free or reduced-price lunch, is 88% Latino, and many kids don’t speak English at home, so volunteers are appreciated. And billionaire Betsy DeVos did what any school volunteer would: hired the student’s mother as a maid and bought her a car. After a few years, Ms. DeVos subsidized the young girl’s transfer to a private Christian school. So that’s how Betsy DeVos knows that school choice works. We look forward to new federal programs that provide jobs and cars to families of all poor students, nationwide. 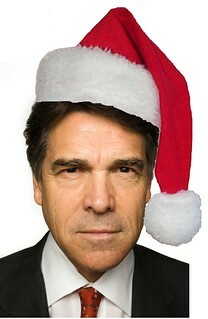 Texas Governor Rick “Santa” Perry signed the “Merry Christmas Bill” into law last week, allowing public school Christmas parties in the Lone Star State. “It’s a shame that a bill like this one I’m signing today is even required, but I’m proud that we’re standing up for religious freedom in this state,” said Mr. Perry. Does that mean school parties for Diwali, Ashura, Festivus, Al Hijra, Niinamesai, Maidyarem, Losar, and Samhain? Smile when you say that, partner. The Republican governor also put coal in the stockings of Texas women when he vetoed a bill allowing them to sue for equal pay for equal work. That might be a big political gift for Texas Democrats next Election Day. Ten years ago, President George W. Bush signed the No Child Left Behind (NCLB) act into law. Mr. Bush, a legacy student at Yale, the Harvard MBA who crashed the world economy, is a great belever in education. 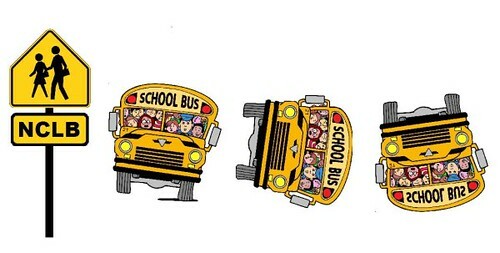 NCLB has been one of the most effective “blame-the-victim” excercises in the history of federal intervention. Schools that face the biggest challenges are wiped off the face of the earth, as if this eliminates their problems. States compete with each other to lower standards so more schools can be judged “adequate.” At ten years old, NCLB enters the 5th Grade. Almost anything is smarter than this 5th grader. President Obama is allowing some states the chance to get out from under NCLB, but that won’t help. What’s really needed: government coordination at all levels to advance the education of America’s children.